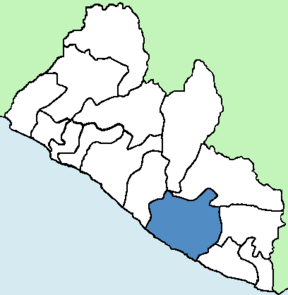 Sapo National Park in Sinoe County, southwestern Liberia covers an area of 1,804 km² (697 sq mi). It is the country's largest protected area of rainforest and its only national park. 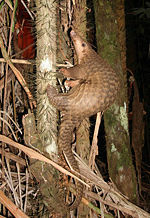 Included in its boundaries is the second largest area of primary tropical rainforest in West Africa, after Taï National Park in neighboring Côte d'Ivoire. Located in Liberia's least densely populated province, it is home to one of the most intact forest ecosystems in the nation. 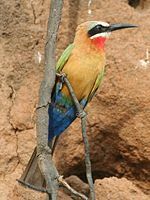 It is within the Upper Guinean forest ecosystem, a biodiverse region hosting the "highest mammal species diversity of any region in the world," according to Conservation International. The park lies within the Western Guinean lowland forests ecoregion according to the World Wide Fund for Nature's ecoregions classification scheme. Two successive civil wars in Liberia in the final decades of the twentieth century caused the destruction of much of the park's infrastructure and equipment. In the early twenty-first century the absence of tangible amenities was nearly complete. International organizations are assisting the government in re-establishing active, effective, planned management of the park with an emphasis on conservation management and field skills. Sapo National Park contains the largest Pygmy Hippopotamus populations in Liberia. 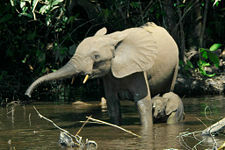 Sapo National Park hosted up to 500 African Forest Elephants in the early 1980s. Located in Sinoe County in southwestern Liberia, Sapo National Park covers an area of 1,804 km² (697 sq mi). The park is bounded to the north by the Putu Mountains and to the west by the Sinoe River. The flat and marshy topography supports a large area of uninhabited forest. Its southeastern area has lower elevations of approximately 100 m (328 ft) and gentle hills, while there are elevations of about 400 m (1,312 ft) and steep ridges in the north. There are many small streams and rivers between these ridges. Sinoe River is the largest river in the park. Mount Putu's 640 m (2,100 ft) summit forms the park's highest elevation. The climate is tropical, with temperatures ranging between 22–28 °C (72–82 °F). The forest's average relative humidity is 91 percent. Annual precipitation at Basintown, 4 km (2 mi) south of the park's headquarters, averaged 2,596 mm (100 in) in the 1980s. The dry season occurs from November to April and the wet season lasts from May to October. January and December are the driest months in the park, and May and August are the wettest months. There is a mid-dry period of decreased rainfall in July, which occasionally extends into August. During the dry season, many of the smaller streams dry up and their sandy and rocky stream beds are exposed. The dry season also causes the larger rivers shrink in size, exposing waterfalls and sandbars. In the rainy season, river levels can rise by more than 4 m (13 ft) in one night, inundating forests near the rivers. Liberia has the largest remaining part of the Upper Guinean forest ecosystem, with an estimated 42 percent of the remaining forest. The rest of the Upper Guinean forest is located in Côte d'Ivoire (28 percent of the remaining forest), Ghana (16 percent), Guinea (8 percent), Sierra Leone (5 percent), and Togo (1 percent). Just an estimated 40-45 percent of Liberia's original forest cover remains, and less than 30 percent of its area is covered by natural forest. Its tracts of forest were once continuous, but are now fragmented into blocks that are isolated from each other as a result of logging, road-building, cultivation, and human settlements. Before the nation's civil war, the Forestry Development Authority calculated that about 35 percent of Liberia's original forest was "undisturbed," 45 percent was "disturbed but productive," and 20 percent was "disturbed and unproductive." Sapo National Park's forest is one of the country's last remaining blocks of tropical lowland rain forest, and one of West Africa's least disturbed lowland rainforests. It is the second-largest area of primary tropical rainforest in West Africa after Taï National Park in Côte d'Ivoire. The park has one of the richest amounts of floral species in the country, with numerous endemic species. A 1983 survey of the park determined it to be composed of 63 percent primary and mature secondary forest, 13 percent swamp forest, 13 percent seasonally inundated forest, and 11 percent young secondary forest. The forest is luxuriant, with trees that can grow to a height of 70 m (230 ft). The forest canopy's height ranges from 12–32 m (39–105 ft), with an average height of 25 m (82 ft). Plant species found in the park include the legumes Tetraberlinia tubmaniana and Gilbertiodendron splendidum, and the tree Brachystegia leonensis. Sapo National Park is a regional center of endemism and biodiversity, at one time hosting around 125 mammal species and 590 types of bird, including a number of threatened species, such as the African Golden Cat, Drill, Gola Malimbe, Liberian Mongoose, White-breasted Guineafowl, and White-necked Rockfowl. 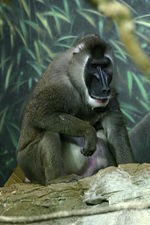 The park is also home to the African Civet, African Fish Eagle, African Grey Parrot, Giant Forest Hog, Great Blue Turaco, Speckle-throated Otter, water chevrotain, three species of pangolin, seven species of monkey (including the endangered Diana Monkey, crocodiles, leopards, bee-eaters, egrets, hornbills, kingfishers, rollers, and sunbirds. Prior to the formal designation of Sapo National Park in 1983 there had been no systematic study of chimpanzee populations in Liberia. Since then, various surveys have confirmed the existence of the Common Chimpanzee (Pan troglodytes), located primarily in its center and western areas, with estimates of the population ranging from 500 to 1,640. The culture of the local Sapo people includes a reverence for the chimpanzee and, therefore, a taboo against their hunting. Seven species of Duiker antelopes are found in the park, including the vulnerable Jentink's Duiker (Cephalophus jentinki) and Zebra Duiker (Cephalophus zebra). Bay Duikers (Cephalophus dorsalis) and Maxwell's Duikers (Cephalophus maxwellii) are reported to be locally abundant. The Park contains populations of the Pygmy Hippopotamus (Hexaprotodon liberiensis), an endangered species which has legal protection in Liberia under the Wildlife and National Park Act of 1988. Unique to West Africa, the wild population of Pygmy Hippopotamuses is thought to number less than 3,000 individuals. According to the World Conservation Union, conservation efforts targeted at the species have "historically been most effective in the Sapo National Park ... where protection is good". According to an action plan published by the IUCN Species Survival Commission, Sapo National Park was deemed in 1993 to be "the only realistic choice" of a "of suitable conservation area" for the Pygmy Hippopotamus. In February 2008, automatic heat- and motion-sensing cameras set up in the park captured the first photographs of the Pygmy Hippopotamus ever taken in Liberia. The photographs confirmed the continued presence of the species inside the boundaries of the park; previously, scientists did not know whether the park's population had survived the civil wars and subsequent poaching and logging. The endangered African Forest Elephant (Loxodonta cyclotis) is also present in the park, with population estimates ranging from "as many as 500" for the early 1980s to between 313 and 430 for the end of the decade; however, the IUCN considers the most recent surveys—both of which relied on dung counts—to be of low quality and reliability. In 1976, the Liberian Forestry Development Authority was created to manage and preserve the country's forest resources. A year later, in 1977, the Division of Wildlife and National Parks was formed under the leadership of Alexander Peal, who served as its head until 1990. By 1982, seven protected areas has been proposed in Liberia, including three national parks. Of these, only Sapo National Park—named after the local Sapo (or Sao) tribe—was formally designated, in 1983, by the People's Redemption Council. At the time, and for twenty years, it covered an area of 1,308 km² (505 sq mi) east of the Sinoe River and south of the Putu Mountains. The park's original boundaries were set and its management plan drafted by the Division of Wildlife and National Parks, in cooperation with the World Wildlife Fund, the World Conservation Union, and the Peace Corps. Throughout its history, Sapo National Park has been threatened by illegal farming, hunting, logging, and mining, "all exacerbated by the country's grinding poverty" and social and political instability. 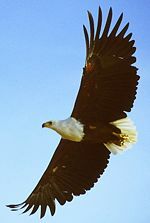 However, in the early 1990s, the World Conservation Monitoring Centre reported that "[r]ural development projects around the park and general acceptance of its existence have helped to minimize potential conflicts." Until the 1990s, poaching was limited due to various initiatives, funded by the United States Agency for International Development, that made local villagers stakeholders to the park's preservation. During the First Liberian Civil War (1989-1996), Sapo National Park fell into the hands of rebel forces, and much of the park's infrastructure and equipment was damaged or destroyed, including a wildlife rehabilitation and orphanage facility constructed in 1989 and supported by Friends of Animals. Of 33 park employees, at least three were killed and seven became refugees.The extent of illegal resource extraction from inside the park during the period of rebel control is disputed. John Terborgh, a professor of environmental science and biology at Duke University, writes that "[l]ogging was rampant during the war". However, Peal reported that logging was limited, and that farming and hunting pressures were minimized by population displacement—including the exodus of people out of over two dozen villages surrounding the park—and the prevailing climate of insecurity, to the extent that species populations actually increased during the war years. The Second Liberian Civil War began in 1999 and ended in October 2003. William Powers, a Catholic Relief Services official posted to Liberia from 1999 to 2001, noted that the Park was a war-time haven for small groups of people who scavenged for food and hunted bushmeat to survive. Logging and poaching became more common after the war's end in 1996. The approval of the Sapo National Park Act (An Act for the extension of the Sapo National Park) on October 10, 2003 expanded the size of the park to 1,804 km² (697 sq mi), constituting an increase of more than 37 percent. The act recognized the park as being "at the core of an immense forests block of the Upper Guinea Forest Ecosystem that is important to the conservation of the biodiversity of Liberia and of West Africa as a whole". The 135 km² (33,359 acres) Mount Nimba Nature Reserve, covering four percent of Liberia's forest land, was created at the same time to become the nation's second protected area. The peace that followed the conclusion of the Second Liberian Civil War gave rise to new threats to the park. Groups of fighters and civilians moved into the park during the final months of the conflict—some to escape the conflict and others to harvest timber or prospect for gold. The influx of people into the park continued after the war's end, eventually growing into a full-scale gold rush. Accompanying or following the prospectors were hunters, many of them former combatants, who poached the park's animals to sell as meat to the settlers. By March 2005, an estimated 5,000 people lived in the park, according to the United Nations Mission in Liberia. Although efforts were undertaken to remove the illegal squatters, the park was not completely emptied until late August-early September 2005, and then only through the participation of conservationists, the Liberian government, and United Nations peacekeeping forces. The park is located in Liberia's least densely populated province, and represents one of the most intact forest ecosystems in the nation. Biological surveys since 2001 have demonstrated that it is among West Africa’s least disturbed lowland rainforest areas, with populations of free-ranging forest elephants, tool-using chimpanzees, pygmy hippos and other species whose West African ranges have been severely reduced outside of Liberia. Yet a quarter century of war and dictatorship have contributed to Liberia becoming one of the poorest nations of the world in spite of its abundance of natural resources. During the country's two civil wars, the park headquarters and field station were destroyed and the major road through the area became overgrown with vegetation. Management of the park essentially ceased during this time. Today there is a near-complete absence of tangible amenities, such as visitor housing or recreational facilities. There are no roads that lead into the park and no trails within the park. Combined with its remote location, these shortfalls lead to the fact that there are few visitors to Sapo National Park. The Darwin Initiative was formed by the United Kingdom in 1992 to assist developing nations in conservation and sustainable use of biological diversity. In 2004 the Initiative began working with the Liberian government to re-establish active, effective, planned management of the park with an emphasis on conservation management and field skills. In addition, the Society for the Conservation of Nature of Liberia received a grant from the Whitley Foundation to begin a program to monitor the park's large mammals. ↑ 1.0 1.1 Ministry of Foreign Affairs. October 10, 2003. An Act for the extension of the Sapo National Park Retrieved February 17, 2009. ↑ 2.0 2.1 2.2 UNEP World Conservation Monitoring Centre. January 1989. Sapo National Park Retrieved February 17, 2009. ↑ 3.0 3.1 3.2 3.3 Russell and Sieber. 2005. ↑ Peter Kahler. November 13, 2000. "Liberia; Liberia's Lone National Park Under Post-war Assessment." Africa News (AllAfrica, Inc). ↑ 9.0 9.1 Powers. 2005. ↑ Carly Waterman. May 8, 2007. Sapo National Park Zoological Society of London, Evolutionarily Distinct and Globally Endangered Programme. Retrieved February 17, 2009. ↑ 11.0 11.1 R. Lewison & W. Oliver. 2008. 2008 IUCN Red List of Threatened Species - Choeropsis liberiensis International Union for Conservation of Nature and Natural Resources. Retrieved February 18, 2009. ↑ James Owen. March 11, 2008. Pygmy Hippo Caught on Camera National Geographic News. Retrieved February 17, 2009. ↑ Goldman Environmental Prize. Alexander Peal Retrieved February 17, 2009. ↑ Protected areas of the world. 1991. ↑ 18.0 18.1 Steve LaRue. October 12, 1994. "Return to Sapo: First a founding, then a rescue of an African national park." The San Diego Union-Tribune: p. E-1. ↑ John Terborgh. 2004. Requiem for nature. Washington, D.C.: Island Press [for] Shearwater Books. (ISBN 9781559635882) p 77. ↑ 20.0 20.1 Peter Kahler. March 29, 1999. "Liberia; Massive Logging and Hunting Worry Liberian Conservationist" AllAfrica, Inc.
↑ 21.0 21.1 21.2 Matthew Clark. November 16, 2006. Backstory: Entering Liberia's national park The Christian Science Monitor. Retrieved February 17, 2009. ↑ Philip Smucker. March 2, 2005. Liberian gold rush threatens forest preserve International Herald Tribune. Retrieved February 17, 2009. ↑ Department for Environment, Food and Rural Affairs. Darwin Initiative Renewing management of Sapo National Park and creation of the Liberian protected areas system Retrieved February 18, 2009. ↑ Convention on Biological Diversity. Conservation International. Guinean Forests of West Africa Retrieved February 18, 2009. Convention on Biological Diversity. Liberia's National Biodiversity Strategy and Action Plan Retrieved February 17, 2009. Retrieved February 17, 2009. Russell, Diane and Skye Sieber. November 21, 2005. Preliminary Biodivesity and Tropical Forest Conservation Assessment for USAID/Liberia United States Agency on International Development. Retrieved February 17, 2009. World Wildlife. Western Guinean lowland forests (AT0130) Retrieved February 18, 2009. History of "Sapo National Park"
This page was last modified on 19 August 2015, at 16:35.